Doctor of Physical Therapy and Blog Contributor. Loves sharing fun facts and believes knowledge is power. Health food, coffee, chocolate and travel junkie and wannabe yoga regular. Believes in the body’s inherent strength and resiliency and has a particular interest in pre- and post-partum care and pelvic health. I think everyone can acknowledge and appreciate the massive changes that the body goes through during pregnancy and I can tell you first hand that I have an entirely different appreciation for it having recently gone through it myself. Very early on in pregnancy, the body releases many hormones, such as relaxin, to help all of the tissues (ligaments [which connect bones to bones], muscles, and tendons [which connect muscles to bones]) in the body “relax” and stretch to make room for a growing baby. The uterus becomes the largest organ and muscle in the body to both house and deliver the baby (it increases from 10 mL to 5,000 mL!) The pelvic ring expands (the top of the bowl of the pelvis) and the sacrum rotates (technically speaking it nutates) to allow the baby’s head to exit during delivery. Areas of the body that don’t normally move much have to stretch and lengthen and become very mobile. It’s a 40 week process and most of the scientific literature estimates it takes approximately 3 years for the body to fully rebound from pregnancy and birthing a baby. One common change that can occur during pregnancy but may go unnoticed until after the baby is born is diastasis rectus abdominis. 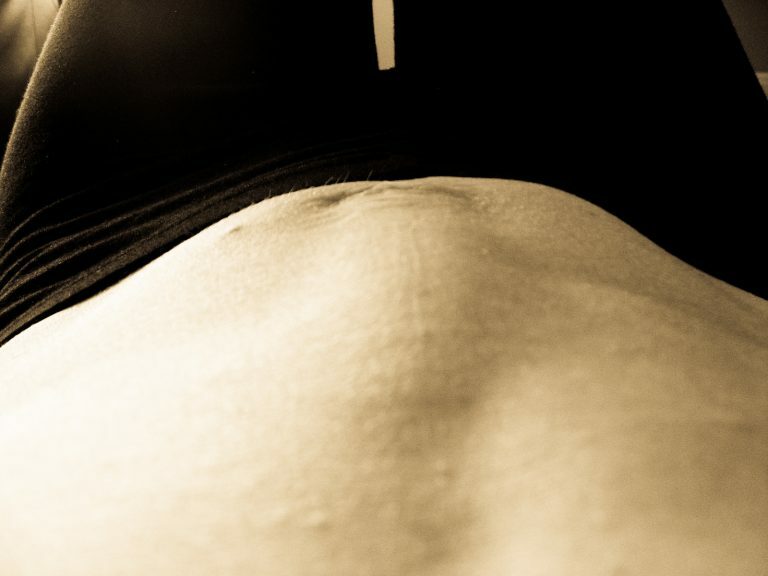 Diastasis Rectus Abdominis (DRA) is the widening of the aponeurosis which is a thick syran-wrap-like sheet of connective tissue that runs down the center of your entire abdomen (stomach) that your abdominal muscles attach to. The abdominal muscles connect to this tissue in the center and make a wall for the abdomen so that the contents of your abdomen (your intestines and organs) are contained within this wall and don’t “fall out.” This blog post focuses on DRA in relation to pregnancy, but it can occur in men or due to obesity not related to pregnancy. During pregnancy, many women will experience widening of this connective tissue (aponeurosis) because of the growth of the baby. The scientific community does not know why this happens to some women and not to others. There are several theories that it may be genetic and that different people have a different level of tolerable stretching of their tissues. It is also theorized that it may have something to do with how strong and tight a woman’s abdominal muscles are prior to pregnancy and that if they are particularly tight, they will not tolerate a lot of stretching to accommodate the growing baby. We know from the literature that DRA happens to all women in the third trimester as the baby grows to its largest size and that this is completely normal. When it becomes abnormal or is technically diagnosed as DRA is when this widening of connective tissue continues after the "4th trimester" or approximately 12 weeks post-partum. DRA can occur vertically all the way down the abdomen from the sternum to the pubic bone with varying degrees of widening (2 cm- 7 cm) in the horizontal direction. Most commonly, the largest area of horizontal widening occurs at or around the belly button (umbilicus) because the fascia is already less thick there because of the belly button. DRA exercises can actually be performed during pregnancy to help reduce further separation and improve strength and function post-partum. How can you tell if you have DRA? You may notice back pain or abdominal pain that you didn’t have before you were pregnant. You may notice “tenting” of the abdominal muscles which happens when you do a crunch or tighten your abdominal muscles or lift something heavy. You may notice a pouch-like appearance to your lower abdomen because the contents of your abdominal cavity no longer have an intact wall to keep them in place. The most accurate way to diagnose if you have DRA is to see a healthcare provider (P.T., M.D., N.D., OBGYN, midwife, D.O., NP or RN to name a few) that can diagnose the condition. What do I do if I have DRA? The good news is that DRA is entirely treatable! With specific exercises, the tissue can reconnect and the abdominal muscles can function normally. There is no blanket set of exercises for everyone, as everyone responds to the exercises differently. It is best to work with a physical therapist who can feel your abdominal tissues and muscles to determine the best exercises for you and to make sure you aren’t putting additional stress on the abdominal tissues which can cause them to separate further.. Earlier in the blog I mentioned a symptom of “tenting.” This tenting effect occurs when the space between the abdominal muscles has increased and the muscles are now bowing out - this is not normal function of the abdominal muscles and it is recommended that you stop activities that cause this tenting. If you are tenting, you are not able to maintain stability in your abdomen when performing that task. Also, not addressing DRA can lead to pelvic pain, back pain, and abdominal pain over the long term so it’s best to be evaluated sooner rather than later to avoid any potential symptoms. General treatment strategies include soft tissue work of the abdomen and back (if tissues are stuck to each other they can't come back together); fascial release of the abdomen and back (fascia from the abdomen ; observation of abdominal muscle performance when performing different activities to determine muscle activation sequencing (there may be over-activation of the rectus abdominis muscles and poor fascial tensioning); breathing exercises (making sure you aren't holding your breath as a way to stabilize your abdomen versus using the correct abdominal muscles to stabilize); assessing rib, pelvic, hip, and thoracic and lumbar spine mobility (poor mobility in these areas can correlate with specific regions of DRA. Eg., DRA around the umbilicus can be due to poor low lumbar spine mobility); and appropriate and specific strengthening exercises (by palpating your abdomen and determining if your tissues are loading properly.) Most professionals who treat and research DRA agree that it takes a lot of dedication and time to reverse the symptoms of DRA, but it is treatable. Experts also suggest waiting until 4 months after termination of breastfeeding before considering surgical interventions such as abdominoplasty if you have not had success with physical therapy exercises. Older Post4th Week of Physical Therapy Month! BINGO!! !